SPRINGFIELD - Ronn and Donna Johnson started off needing a way to get their daughter, Brianna, to Girl Scout meetings. Brianna was born with brittle bone disease. Today, she works as director of operations for state Sen. Eric Lesser, D-Longmeadow. That effort lead to their creation of the Brianna Fund for Children with Physical Disabilities, which raises funds and then builds ramps and access points, buys accessible vans and otherwise helps give children living with disabilities access to their communities and the wider world around them. "The goal has always been a larger one of building public awareness that these children with disabilities are filled with the same talent as any other child and should be included. They should not bee seen as burdens," Johnson, a former MassMutual executive who is now president and CEO of Martin Luther King Jr. Family Services in Springfield, said. "We feel blessed in many ways." Since 1998, the Brianna Fund has raised more than $500,000, much of it with an annual gospel music festival, and given grants to 47 families. Johnson and his wife, Donna, a who worked for the Center for Human Development and most recently in Gov. Deval Patrick's Springfield offices, are two of the five 2015 recipients of the Order of William Pynchon. Given every year since 1915 by the Advertising Club of Western Massachusetts, the awards recognize community service and volunteerism in the Pioneer Valley. The awards are named for Springfield founder William Pynchon. This being the 100-year anniversary, the AD Club held Monday's news conference under the rotunda dome at the Springfield Central Library. The Ad Club will host the Pynchon Awards ceremony Nov. 19 at the Springfield Museums. Recent ceremonies have been held at the Chez Josef in Agawam. Tickets are $65 and more information is available at www.adclubwm.org. "We thought it was time to bring it back to Springfield," said organizer Nancy Urbschat. Pynchon Trustee David Cecchi said the first awards in 1915 were in the Kimball Hotel, about a block away from what is now the Lyman & Merrie Wood Museum of Springfield History. 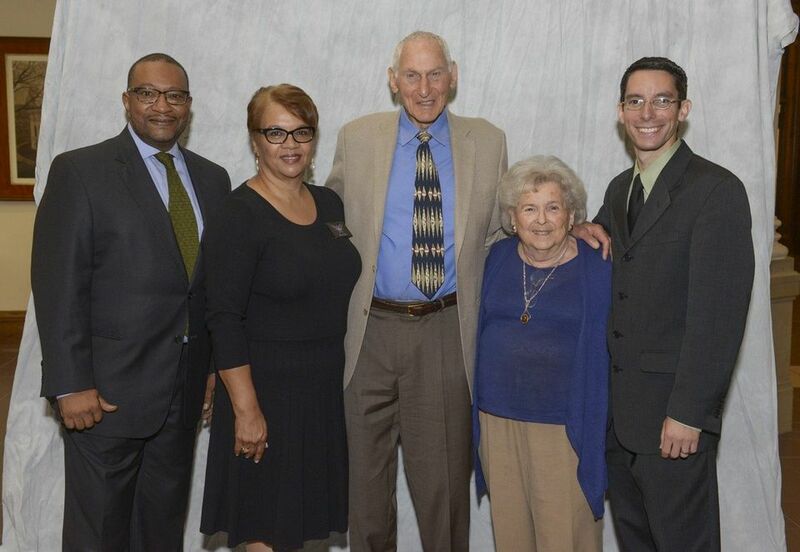 Recipients are: the Johnsons, Gary Bernice, band director at the Springfield High School of Science and Technology; volunteer Sue Ellen Panitch and philanthropist Harold Grinspoon. Panitch, who lives in Holyoke, spoke of her longtime dedication to environmental conservation , particularly the Connecticut River. Her love of the Connecticut must have been shared by Pynchon himself. "He came to this valley , took one look at our magnificent river and said 'We're home'. I feel the same way," Panitch said. Panitch is a 40-year member of the Holyoke Conservation Commission and has been active in dozens of organizations, including the Therapeutic Equestrian Center and its fundraising event The Future begins Here. Grinspoon, who made his fortuen in real estate, and his wife, Diane Troderman, have signed The Giving Pledge, a commitment to give at least half his estate to charity. The pledge was initiated by Warren Buffett and by Bill and Melinda Gates. Grinspoon's charities include the Simon Grinspoon Farm Award which helps lcoal farmers make needed improvements, OWL, Opening the World of Learning , program at the Springfield Public Schools , the Excellence in Teaching Awards , the PJ Library that gives Jewish Children books, music and other materials to foster Jewish learning and annual entrepreneurship and "elevator pitch" contests. The Sci Tech Band was the subject of a recent documentary, but is much more than that, Bernice said. He started in 2007 with 20 disinterested students. Today, more than 500 Sci Tech students -- a third of the student body -- participate in band. for many, its their main motivation to attend and to do well in school. "What happens in band is more than just music. it's more than graduation rates. It is family and community," Bernice said. "Our students are becoming the kind of people Springfield needs."